It's no wonder that many RV and outdoor enthusiasts describe camping in Alaska as the experience of a lifetime. Alaska is rich in spectacular scenery, solitude, wildlife, and wilderness adventures. Miles and miles of virtually empty roads thread through towering snowcapped mountains, crystal blue glaciers, and wilderness just a short boat or airplane ride from civilization. - Over 400 Campgrounds throughout Alaska and along the roads north in the Yukon Territory and Northern British Columbia with full campground descriptions and maps showing exact locations. - Complete coverage of the routes north, including the Alaska Highway, the Cassiar Highway, the Alaska Marine Highway, and the Klondike Loop. - RV rental information for renting a camping rig in either Alaska or Canada. - Things to do and see throughout your trip, including suggested fishing holes, hiking trails, canoe trips, wildlife viewing opportunities, and much more. stores, dump stations, tourist information offices, museums, and free camping options." 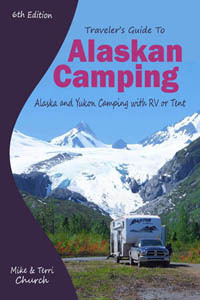 "And being prepared, in our opinion, is having Traveler's Guide to Alaskan Camping in your possession." "Don't head north without Traveler's Guide to Alaskan Camping." Chapter 1 - Why Camp Alaska?